For all my bullishness about the wonders of public transport, it does go wrong sometimes. So it was a couple of weeks ago, when my Crewe bound train was cancelled and I was left with an hour to kill before the next one. Never one to waste an opportunity, I went for a wander round the city centre. Liverpool has completely transformed itself in just the short time I have lived here. It really is remarkable. When I moved Oop North thirteen years ago, the biggest redevelopment project in the city was Queen Square, with its attendant bus stands and Nando chicken. Now huge swathes have been transmogrified into shops, restaurants, apartments. Rope Walks really is an exciting place to wander round, and the new Liverpool One shopping district is amazing. Even if they did have to demolish the Escape and Quiggins to build it. I hope the one-two of 2008 hangover and credit crunch unpleasantness don't send Liverpool back down the slope again; it's achieved so much in so little time. The effects haven't reached everywhere, of course. Toxteth - despite a great deal of good, ambitious plans - is still the bad side of town. Unloved, infamous, the huge mansion rows are still punctuated by burnt out shells, like bad teeth, and it's definitely not a place to go wandering unawares. I was only at the tip of it, the wrong side of Parliament Street - I was in the shadow of the Anglican Cathedral - but it still smelt of neglect and disdain. I was here in search of history and future, a sort of Marty McFly type trip. There's an abandoned station here. Closed in 1907, St James station was in the perfect place, logistically speaking - it broke up the long gap between Liverpool Central and Brunswick stations. Unfortunately, there was no-one around to use it, and it was shut to passengers. Temptingly, it's still there. Well, sort of. So in my quest to visit all the stations, I thought I'd pay it a visit. I should perhaps clarify. This post may be of more interest to people who like brick walls. It's a very nice wall, don't get me wrong; but it's not exactly Euston, you know? This is the view from across Parliament Street. Behind this wall, there's a cutting, with two platforms still in existence down below. It's a very high wall, though. So as I wandered around it, all I got was a good view of some Victorian mortar work. which gives access to a stairway, which allows you to get down to the unused, unloved platforms. Even though they haven't seen a passenger since crinoline was in style, the area is sort of kept in use; it's a handy access point for workmen to the tunnels, and, in the event of some emergency, it could theoretically be used as an escape tunnel. I am choosing to believe that it is a glimpse of the track, with the overgrown platform to one side. I could be right. Oh, fine: if you want a full and frank explanation, with decent photos, go here. There are sort of tentative plans to reopen St James, one day. The platforms are there, there's plenty of open ground next to the cutting which would enable a station facility, and perhaps a bus interchange, to be built. There's no expensive tunneling or engineering needed. The problem is that it's nowhere. On one side is the huge Cains brewery, which isn't exactly the great employer it once was. On the other is an abandoned church. Even the maisonettes over the road have been boarded up ready for demolition. And even if it were opened - you're not that far from the city centre. 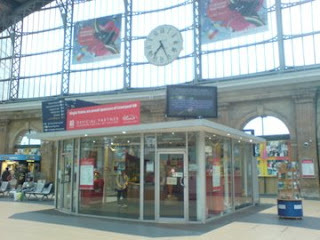 You can walk to Liverpool Central in about ten or fifteen minutes from here, for free. Why pay to cut that journey time by a few minutes? I'd love to see it reopened, obviously, but I won't hold my breath. The 21st Century Railway Is Coming. Bring Your Wallet. This blog is about many things. The inadequacy of the Merseyrail map, my desire for immortality in the pages of Modern Railways, a catalogue of my never ending array of disastrous weather-buffeted hairstyles. But essentially, at heart, it's about architecture. I've always been drawn to railway station architecture, its forms and shapes - the Victorian declaration of might, the Art Deco sweep in the Thirties, the shabby second rate British Rail years, the gleaming glass and metal of today. I started this whole project to see stations, not trains or signalling, because that's what I love to see. I hate to see stations going to ruin. Long-term readers may remember my dismay at Hough Green, which had been allowed to collapse into dereliction and was unloved, and my horror at Little Sutton's boarded up windows. I want to see them shining and used and unshabby again. I'm an optimist, basically. This blog's also about hope: about the future. My glee at seeing St Helens Central's new, glamorous glass building wasn't affected; I want to see money invested in the network and its facilities. 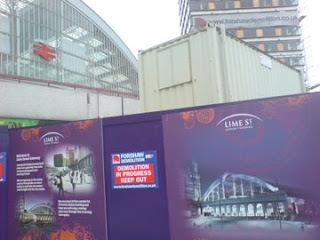 I'm happy to report a whole load of investment is being pumped into Lime Street station right now. The money's going in two places, both of them badly needed. Out front, a whole load of cash has been found to demolish the ugly public toilet-esque row of shops that block the front of the station from the road, as well as the mangy looking office block (Concourse House) beside it. This has been controversial for a while after two selfish bastards - whoops, sorry, I mean caring shopkeepers, forced a High Court decision on the compulsory purchase of their premises. The delay meant that a tower earmarked to replace Concourse House has now been credit crunched, so all they're going to put out front is a lot of posh paving. But this will mean all the difference, as you'll be able to see the grand sweep of Lime Street's frontage again, and from the inside, you'll be able to see out onto St George's Plateau and that huge tv screen thing that keeps flashing twenty foot high images of the Joker at me in a thoroughly unnerving fashion. 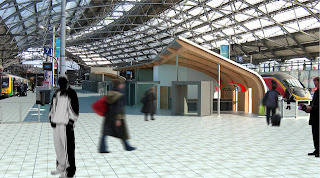 Inside, they're upgrading the passenger facilities. 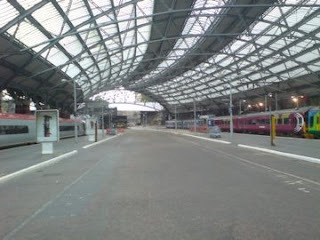 Lime Street has always been divided in two (leaving aside the underground station). 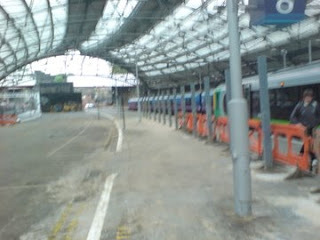 On the one side, behind the North Western Hotel, are the "suburban" trains on platforms 1-6, for Wigan, Manchester, and the like. Around them are the ticket office, the bars, the WH Smiths, the Burger King, and all the other big terminus retail outlets. Plus the toilets. The long London bound Pendolinos depart from the other side, which is severely underdeveloped. Platforms 7 to 9 have nothing in the way of facilities, not even a ticket barrier to call their own (crowd control barriers have been strung across the way for the last few years). In the centre is a long cab road, which once provided access for mail vans and taxis, but hasn't been used for years. ...so you'll be able to complain about Beardy Branson's rubbish service in far more salubrious surroundings. In addition, there will be four new retail outlets. Having passed through Manchester Piccadilly a couple of months ago, and been confused to find that someone had let some trains barge through the centre of the shopping mall, I'm unsurprised at Network Rail's desire to improve our shopping experience. No word yet on which retailers will be taking spce there. I'm hoping for a Starbucks so I don't have to use that Costa any longer, with its burnt tasting coffee and its young offender staff. I'm guessing it won't be a new branch of Harvey Nicks, anyway. Apologies for the blurring. These have the effect of cordoning off the platform from the new retail area - but the platform is now only about six feet wide. I came off the train tonight, and things have progressed a bit more, to the extent that the whole centre area has been blocked off - but it makes the space for passengers to alight really narrow. As all the bodies moved down towards the exit it was slightly claustrophobic (and bloody annoying when the dopey tart in front of you decides to just stop in the middle to attend to her wailing brat, thereby blocking everyone from getting away). They'll have to hold the passengers in a waiting area, because there was no space at all for people to get on and get off at the same time. The plus side is that as Lime Street's a terminal station there's usually a bit of a breather before the train moves off again anyway. 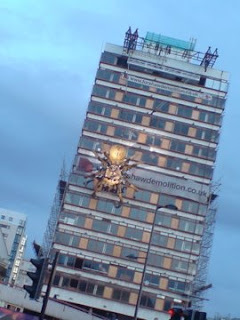 It's a giant mechanical spider crawling down the side of Concourse House. BRILLIANT. More info on that (hurry, this weekend only!) can be found here.